The Analog-to-Digital Converter (ADC) can convert an analog input signal to a 10-bit binary digital representation of that signal. The Microchip microcontrollers analog inputs which are multiplexed into a single sample and hold circuit. The output of the sample and hold is connected to the input of the ADC. The ADC generates the 10-bit binary result via successive approximation and stores the conversion result into the ADC result registers. The ADC uses a voltage reference that is software selectable to be either internally generated or externally supplied. The ADC can also generate an interrupt upon completion of a conversion. This interrupt can be used to wake-up the device from Sleep. We'll step through each of these below. The first configuration setting is the I/O pin setup. Most of the ADC I/O pins can be used as either an analog input or a digital input. When converting analog signals using the ADC, the I/O pin must be configured for analog input by setting the associated bits in the TRIS register and ANSEL register. The TRIS register for the I/O pin needs to have its associated bit set to a 1 to make it an input. If the I/O pin is part of the PORTA block then the TRISA register contains the bit. The next step is to set the bit on the ANSEL register for the I/O pin and set the bit to a 1 to enable the ADC on that pin. If the I/O pin is part of the PORTA block then the ANSELA register contains the bit. The ADC multiplexer needs to be connected to the I/O pin prior to starting the sample and hold process. This is done with a set of bits in the ADCON0 register. 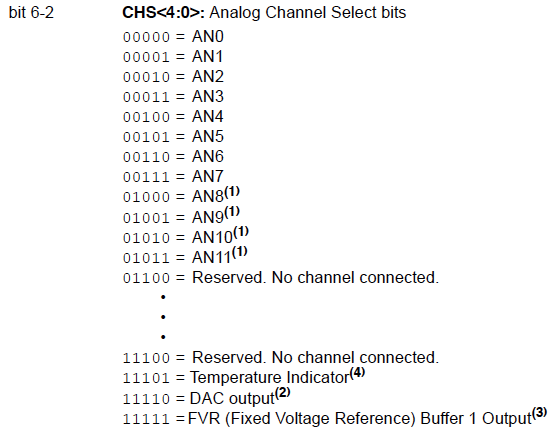 Before an ADC sample is requested, these channel select bits are set to connect to the desired I/O pin. Only one pin can be connected to the ADC at a time so after the process is complete then the selection bits can be changed to connect to the next pin and the ADC process starts over again. 2: See Digital-to-Analog Converter (DAC) Module for more information. 3: See Fixed Voltage Reference (FVR) for more information. 4: See Temperature Indicator Module for more information. The ADC can use various voltage reference sources as the basis for analog voltage measurements. VDD and VSS are the connections to the voltage bus that powers the device. VREF+ and VREF- are specific I/O pins on the device. An external voltage reference is connected to these pins. FVR is the Fixed Voltage Reference that is a feature on many PIC devices though not all. It can include a single voltage or sometimes more than one voltage level is available. The voltage reference selection bits are in the ADCON1 register and the selection options are shown below. FOSC is the system oscillator that is running the device instruction clock. The clock is critical to produce the fastest but also accurate Analog to Digital Conversion. For correct conversion, the appropriate TAD specification must be met. An ADC clock can be easily selected from the chart below. A similar chart appears in the device data sheet. The values that are best show up in the middle of the chart in a white background. The internal oscillator FRC selection will be a slower conversion but will guarantee the TAD requirements are met. The FRC can also be used in sleep mode to run ADC measurements. conversion. This interrupt can also be generated while the device is operating or while in Sleep. If the device is in Sleep, the interrupt will wake-up the device and then process the Interrupt Service Routine as long as the interrupt bits are enabled. The ADC Interrupt Flag is the ADIF bit in the Peripheral Interrupt (PIR1) register 1. 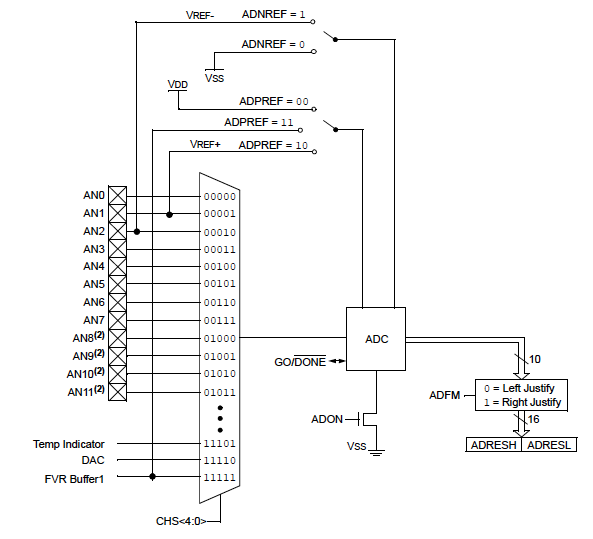 The ADC Interrupt Enable is the ADIE bit in the Peripheral Interrupt Enable (PIE1) register. The Global Interrupt Enable (GIE) bit and the Peripheral Interrupt Enable (PEIE) bits in the INTCON register must also be enabled. After an interrupt from sleep mode is executed and the interrupt service routine and ADC are completed, the ADIF bit must be cleared in software. The ADC conversion result is stored in two 8 bit wide registers; ADRESH and ADRESL. 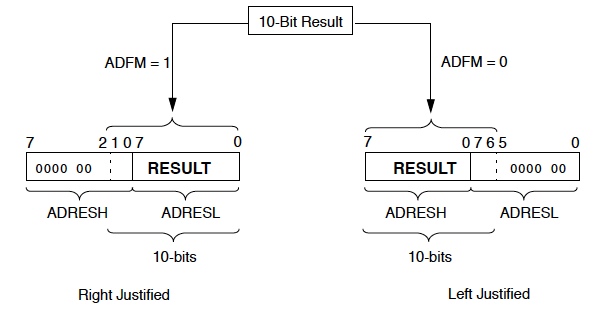 This register pair is 16-bits wide so the ADC module has the flexibility to left or right justify the 10-bit result in the 16-bit result register. The ADC Format Select bit (ADFM) in the ADCON1 register controls this justification. The extra bits in the ADRESH and ADRESL registers are loaded with ‘0’s’. The result can then be copied to a variable or used in an equation to implement a function based on the ADC result. Each configuration option is selected as a check box or from a drop down menu. After the selections are made, then the code is generated and placed in the project. Two files are created named adc.h and adc.c. 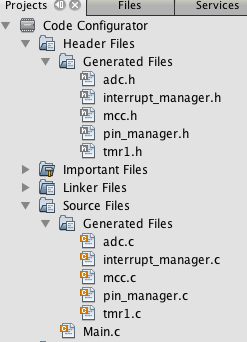 They contain ADC setup code and also custom functions to use the ADC within your main project files. The video below shows a step by step example of setting up the ADC using the Microchip Code Configurator.